Here's another chance for you to win a credit for Smile Brilliant, your sixth chance. This one runs through 4/6 and is open to US and Canada residents, except the poor souls in Quebec who can't enter since the giveaway isn't offered in French, too. Bonne chance. Have you been meaning to whiten your teeth? Have you tried and the results have been less than stellar? Everyone has teeth-dulling habits like drinking wine, coffee, tea, chewing tobacco, constantly eating blueberry pie, not brushing, being over the age of 40--life happens! If you can relate, then check out this great giveaway! You can read the review here! We're accepting entries from March 19 - April 6th! 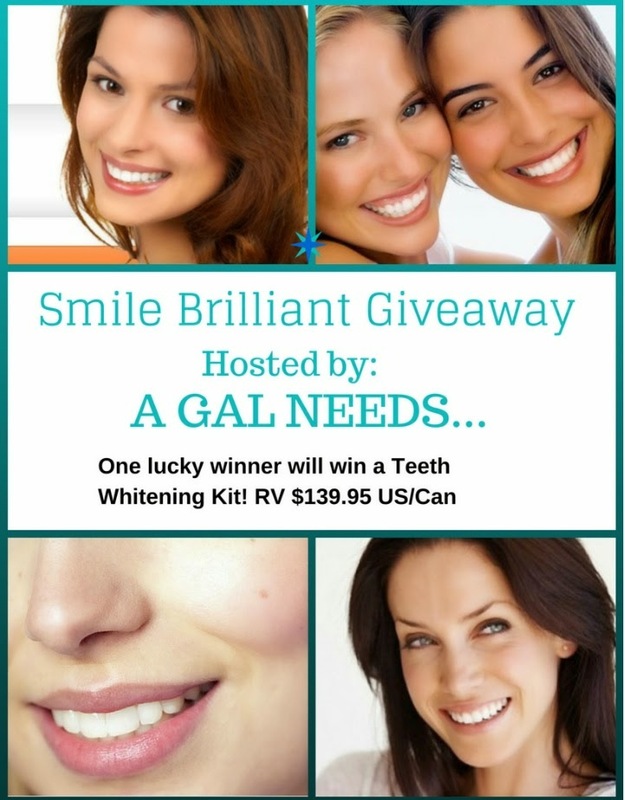 We are excited to announce that 1 winner will receive a $139.95 credit to Smile Brilliant, which is enough for 2 Teeth Whitening Trays + 3 whitening gel syringes and 3 desensitizing gel syringes OR the Teeth Whitening Trays + 6 whitening gel syringes! Enter in the Rafflecopter below! Open to U.S. and Canada. For complete Terms and Conditions, see Rafflecopter form. Please consider liking each and every one of the participating bloggers on Facebook when you visit! We work hard to bring great information and giveaways like this to you! I think having whiter teeth does make a more positive difference in how people react to you. i am very conscious of people's teeth when i am looking at them, pretty white teeth make me think people take care of themselves...it makes a big difference in someone's appearance. Yes, I think to some degree the whiteness of your teeth does affect how others view and relate to you.